Over the past two decades, Downtown Phoenix has gone through many changes, transforming the community from an almost deserted town to an exciting and vibrant place to live, work and play. With the energy and diversity of Arizona State University, numerous new parks and green spaces, the light rail making the community accessible to other Phoenix areas, a myriad of exceptional food and entertainment, a strong job market, and a wealth of fantastic housing options, Phoenix Downtown has become one of the most desired urban locations in the Phoenix Metropolitan Area. The Phoenix Downtown area presents residents with unique and eclectic atmosphere. Here you’ll find everything from beautiful historic districts to urban condominium and loft buildings nestled neatly against downtown skyscrapers, beautiful parks and the Arizona State University campus. Tucked away in each corner of town are quaint bistros, world-class restaurants, charming coffee shops and some of the best nightlife and sporting activities in the state. 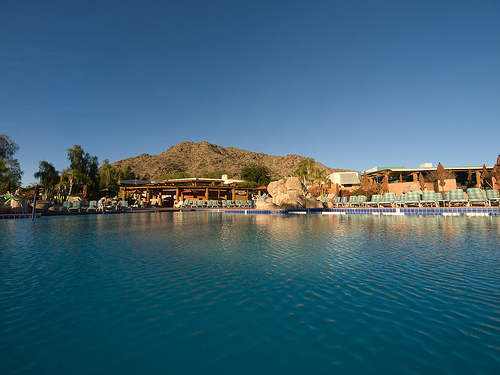 When you choose to live in the Phoenix Downtown area of Central Phoenix, all this and more can be at your fingertips. Residents of Downtown Phoenix are able to utilize the light rail to travel along the 20-miles of tracks from Central Phoenix to Tempe, Mesa and Sky Harbor International Airport. Both the I-10 and I-17 freeways are also just minutes away, and the Downtown Area Shuttle (DASH) provides transportation on both the Downtown Loop and the Government Loop. 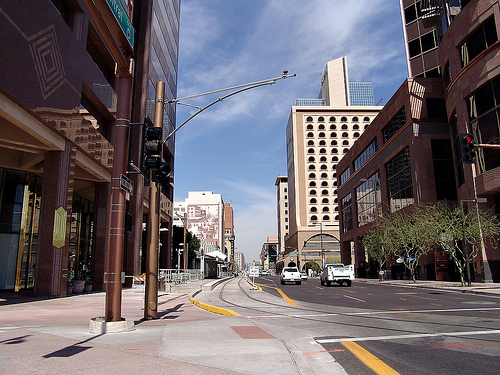 Downtown Phoenix is also very walkable, with easy access to all the conveniences you would expect of a big city. Other options like pedicabs and a free evening trolley funded by the Downtown Partnership are available. You can catch the trolley, which stops at most sports venues, theatres, restaurants and bars, on Thursdays, Fridays and Saturdays. Parking is also a breeze, with more than 25,000 parking spaces located throughout the area. Because of its size, Phoenix has a myriad of schools for parents to choose from. In fact, there are more than 325 public schools and 200 charter and private schools in the immediate area. One of the best resources to learn more about the Phoenix area public schools is on the City of Phoenix School Districts website. The Downtown Campus of Arizona State University is also located here. Hospitals are plentiful throughout the Phoenix area, however St. Joseph’s Hospital is located just minutes from downtown in neighboring Midtown. If you’re looking to be positioned in the heart of all that Phoenix has to offer, living in the Phoenix Downtown area is a must! From professional sports to fine dining and the arts, this area has something for everyone. Home to a recently renovated Convention Center that plays host to numerous events, concerts and productions throughout the year, the Chase Field and the U.S. Airways Arena, as well as many concert venues, museums, art galleries and theaters, you’ll easily get your fix of entertainment in Downtown Phoenix. One of the newest parks in the Phoenix Downtown area is Civic Space Park, which is located across the street from Arizona State University’s Downtown Phoenix campus. At night, you’ll find a large illuminating sculpture that soars high into the sky. During the day, the park offers a wealth of shaded areas. It’s not uncommon to find residents enjoying yoga in the park, as well as local movie nights. Other popular parks include Patriots Square Park at CityScape, located at Central Avenue and Washington Streets, the Japanese Friendship Garden, and the Margaret T. Hance Park, which is also home to the Irish Cultural Center. Located in the heart of Phoenix Downtown, the Arizona Center is an open-air oasis of shopping, dining, ponds and gardens in a unique and beautiful urban setting. Within the center, you’ll find a host of excellent stores and specialty retailers, as well as a number of restaurants ranging from sandwich shops to five-star cuisine. The Arizona Center is also home to the AMC Theatres. 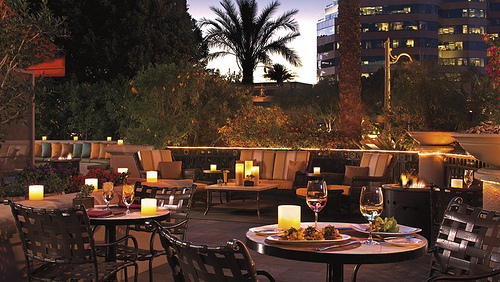 Dining in Phoenix Downtown is also a unique experience, with a wide variety of cuisines to choose from. The Downtown Phoenix Dining Guide will give you a wealth of information on local restaurants and specials. Some of our favorites include: Tom’s Tavern & 1929 Grill, Copper Blues, the Phoenix Public Market, the Tilted Kilt Pub & Eatery, Squid Ink Sushi, Fuego CityScape, La Piazza Locale, Crust Italian American Fusion, and the Hero Factory. Perhaps one of the most concentrated areas for dining in Downtown Phoenix is CityScape, where everything from a sweet treat at Yogurtini to a pre-concert dinner at The Arrogant Butcher can be found. This is a do-not-miss in Downtown Phoenix. If you’re looking for an urban oasis where all the wonderful amenities of Phoenix are located just minutes from your door, the Phoenix Downtown area offers everything you could hope for and more. And, because this is a community experiencing a revival, real estate prices are attractive and options are plentiful. Search properties in the Phoenix Downtown area today using the state-of-the-art search capabilities of this website, and contact Roberta Candelaria and her team at Phoenix Urban Properties today to learn more. They look forward to hearing from you soon!